A critical bug(CVE-2014-0092) in handling the errors in the GNU Security library GnuTLS affects hundreds of software packages including RedHat, Debian and Ubuntu distros. 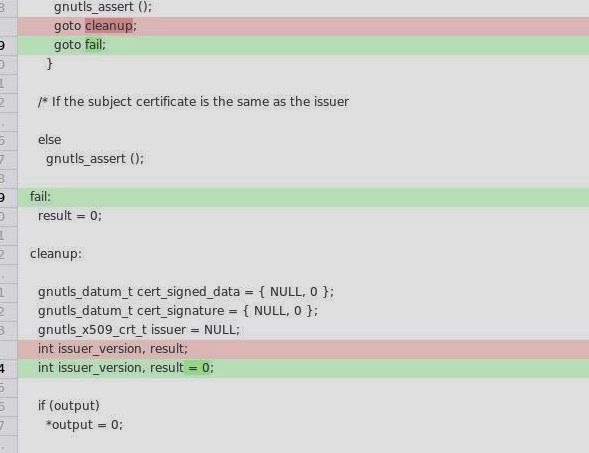 According to RedHat security advisory, there is a coding error in GnuTLS which fails to handle certain errors that could occur during the verification of an X.509 certificate, results in reporting 'a successful verification'. "An attacker could use this flaw to create a specially crafted certificate that could be accepted by GnuTLS as valid for a site chosen by the attacker." the advisory reads. The bug exists in returning the value in the verify.c file (https://www.gitorious.org/gnutls/gnutls/commit/6aa26f78150ccbdf0aec1878a41c17c41d358a3b?diffmode=sidebyside). It appears the uninitialized variable "result" is causing the problem. There is also another coding error where it returns value of issuer_version when issuer_version is less than zero, instead of returning zero. And, when result is less than zero, it goes to 'cleanup' location instead of 'fail'. Nikos Mavrogiannopoulos from Red Hat Security Technologies Team discovered this security flaw, while doing an audit of GnuTLS for the RedHat. Users are advised to upgrade to the latest GnuTLS version (3.2.12 or 3.1.22) or apply the patch for GnuTLS 2.12.x.